Happy Thursday everyone! I am sorry I have been MIA for a couple of days, life gets in the way sometimes. 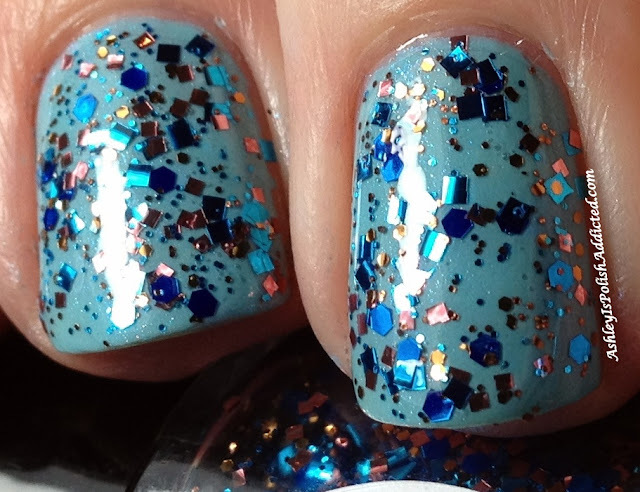 I was going to do this post last night but I discovered a deep tear in my middle nail of my swatching hand (BOO) so instead of posting I got several polishes swatched before chopping all of my nails down to nubbins. <sadface> But let's get on to the pretties I have for you today! Maya Cosmetics collaborated with a couple of bloggers to create a special duo of exclusive polishes for a giveaway but they turned out so nicely that they're now a part of her line: Sanctuary by Lisa at Cosmetic Sanctuary and Wyoming Skies by Kelly at Set in Lacquer. 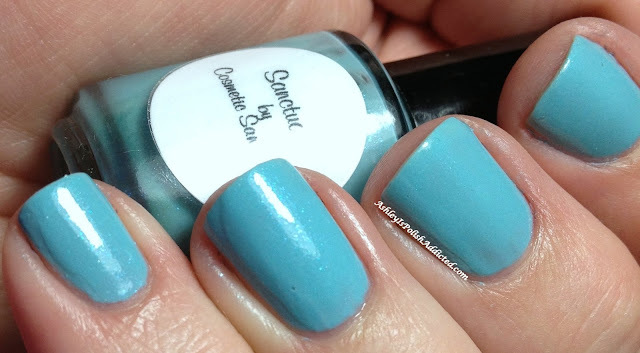 Sanctuary is a bright aqua blue creme with aqua and silver shimmer. I had a hard time capturing the shimmer with my camera but you can see it in the macro. It is more noticeable in person than in my photos. I had some issues with the formula on this one, very surprising for Maya. It didn't self-level well - make sure to go slow and make sure each coat dries in between application. I used 2 coats of Sanctuary and topped it off with one coat of Poshe. Now let's see it partnered with Wyoming Skies! Wyoming Skies is blue, caramel and warm pink glitters in various shapes and sizes in a clear base. I used one coat of Wyoming Skies over 2 coats of Sanctuary with one coat of Poshe top coat for the photos. 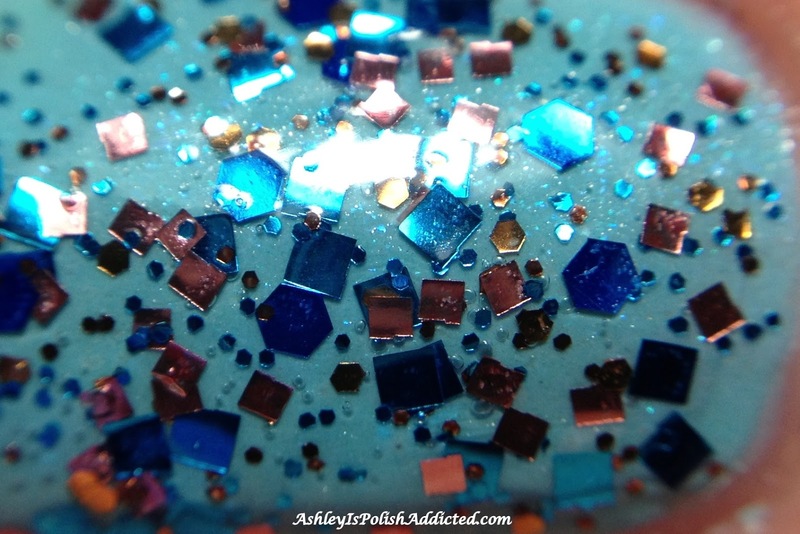 No issues at all - all glitters came out nicely and laid flat on the nail. 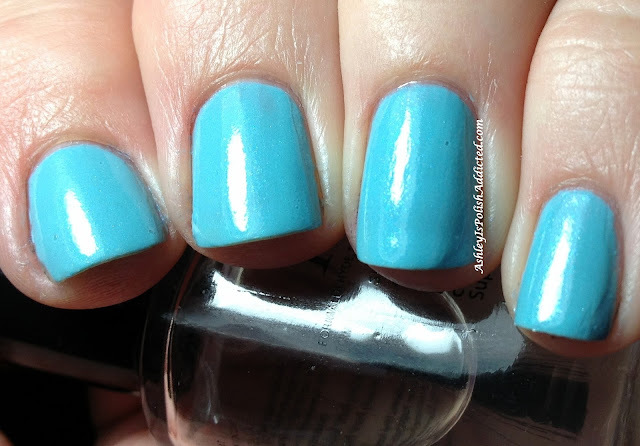 Maya Cosmetics polishes sell for $9.50 for a full size 15 ml bottle. You can purchase through her website here. 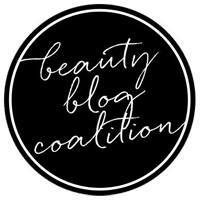 Also make sure to follow via Facebook, Twitter and her blog to stay up-to-date on stock and collection information!